In 1965, Horace Mann established the John Dorr Nature Laboratory in Washington, Connecticut with a gift of 83 acres. The Laboratory now encompasses 275 acres of fields, streams, and ponds in which students can explore nature and engage in outdoor pursuits. Dorr’s resident four-person faculty instructs students in environmental science, conservation, and outdoor living. Student visits begin in the second grade, with overnight programs beginning in the third grade. A recent $8 million capital project resulted in the creation of a new access road, the purchase of additional land, the construction of a new bunkhouse and faculty residence, and the building of a new lodge and multi-purpose barn/classroom. The project also upgraded mechanicals and utilities. The new facilities insure greater sustainability and provide more space for programming. electricity our campus is using and generating. 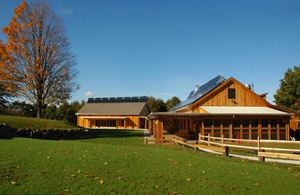 The website explains how our system works and depending on the time of day and current demand at Dorr, you can see the electricity generated by the solar panels being sold back to Connecticut Light and Power. Learn more about the program at the Dorr Nature Lab.